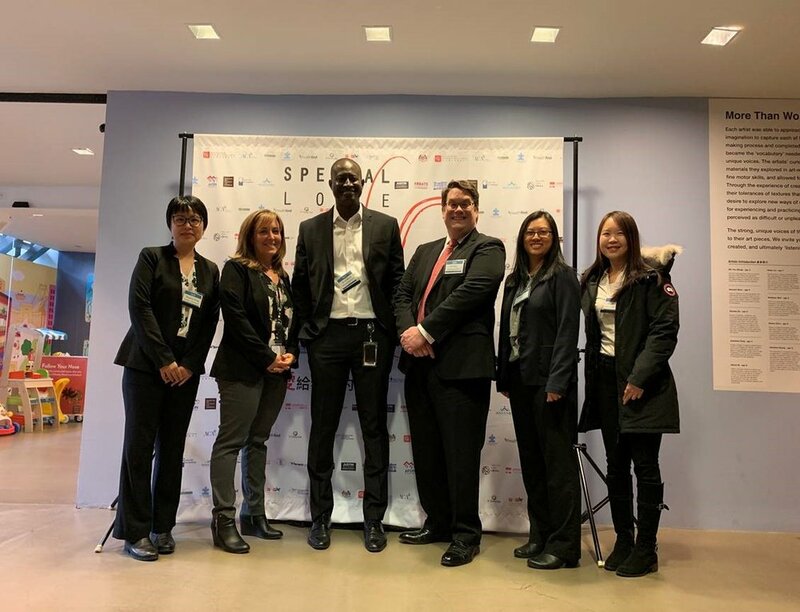 Advance Care Alliance of New York is honored to have participated in the Autism Month launch and press conference organized by the Alliance for Families with Developmental Needs. ACANY CEO Jay Nagy addressed the audience of members and families on the importance of supporting people in getting timely diagnosis in tandem with ensuring community support in providing integrated comprehensive supports and services. Alongside him on the program were parents from the NYC Chinese community who shared their experiences. Many spoke on the importance of breaking the stigma around I/DD within the Asian American community through education and advocacy. Participating in AFDN’s powerful launch and press conference aligns with ACANY’s mission of centering members and their families through advocacy. We are proud to have participated in such a powerful event! On National Autism Awareness Day, the ACANY Intake Department tabled at the Autism Awareness Community Outreach Fair to educate people on how they can enroll for care coordination services. The outreach fair was presented by the New York Presbyterian Autism Task Force, a team of providers from New York Presbyterian, Center for Autism and the Developing Brain. The fair was held for families to obtain information and support for individuals who are diagnosed with Autism Spectrum Disorder. This was the first ever fair of its kind and will be held annually moving forward! We can’t wait to come back next year! Interested in joining our lovely Intake Department? Apply to be the Intake and Benefits Access Coordinator today! The month of March is National Developmental Disabilities Awareness Month. Since its public proclamation in 1987, we have come a long way from the institutional model of care towards person-centered and community-based care. This is thanks to the hard work and advocacy of people with I/DD, families, communities and professionals which continue today. Developmental Disabilities Awareness Month is a great way to acknowledge individuals with developmental disabilities. It's a great time of year! Acknowledging and celebrating individuals with I/DD is fantastic—this month and all-year-round! Working with individuals with I/DD is outstanding. At one point in my life, I was temporarily unable to perform my day-to-day tasks by myself due to an injury. This experience added to the empathy I have for people for whom that is a permanent experience. It is important that support is available and delivered in a way that is both respectful and empowering. Doing this job fits with my morals and values and I love what I do! It is important to me that individuals with I/DD get to experience life or do basic things we take for granted. In this role, a commitment to teamwork is important. We all need to work together. I stay enthusiastic because I KNOW that the people I work with WILL succeed at what they set out to do. One person was accepted and now attends the NYU Tandon Disability Studies Consultants Program. She is now a consultant! Consultants help teach NYU students about disability. I am oh so proud of her! Individuals with developmental disabilities deserve a full life! I would like to take a moment to applaud your agency for your services. I have been receiving services for Kennedy for many years and I rarely come across someone who is both efficient and supportive. My daughter and I love Mrs. Byrdsong and I wouldn’t want to work with anyone else. She is always available to assist us and she is extremely informative about programs and services I might not be aware of. I can’t say enough to express how very pleased my family is with Mrs. Byrdsong. She is indeed a rare gem. Do you have any reflections this Developmental Disabilities Awareness Month? Feel free to share your story with us by emailing hrdepartment@myacany.org. Apply to be on the ACA Advisory Board! 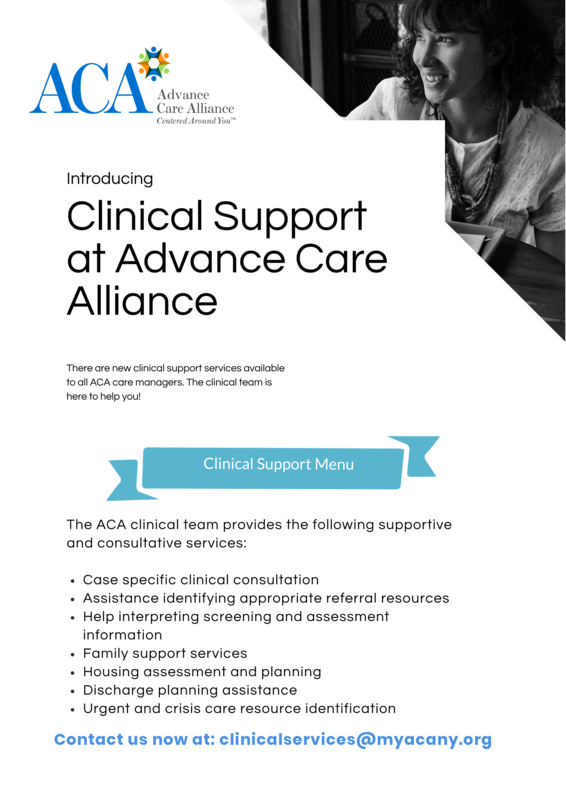 The purpose of ACA's Advisory Board is to engage and incorporate feedback from the individuals and families we serve. If any individuals or family members are interested in participating, please complete our online application. Please circulate the PDF version of our flyer to your networks and download it here. The three entities — Advance Care Alliance, Life Plan, and Person Centered Services — currently coordinate care for approximately 65,000 individuals with intellectual and developmental disabilities, covering all 62 counties in the state. They have signed a Memorandum of Understanding to create a person-centered, comprehensive health-care solution that will expand health care and services options for people with intellectual and developmental disabilities. With a strong partnership that reaches to every corner of the state, the collaboration will leverage the group's size, expertise, and geographical reach to expand health-care choices, incentivize and train providers, increase preventative care and ultimately improve outcomes. It will use the group's long history of serving individuals with intellectual and developmental disabilities and combine it with a world class health-care network, with the goal of helping people live fully inclusive lives in their communities and offering individuals and families improved quality of life. The collaboration, according to the CEOs from all three entities, will make sure proven, experienced Care Coordination Organizations in every part of the state are driving the future of care, and that individuals and families are offered more choice while being empowered to make their own health-care decisions. The partnership comes in the wake of New York's announced transformation plan that includes a transition to Medicaid managed care. The first step in the state's Office for People With Developmental Disabilities' restructuring of the system came on July 1, 2018, when it broadened the care coordination model to a Health Home system, centering all support services in one place through the creation of Care Coordination Organizations (CCOs). "I'm very excited to learn that providers I know and am comfortable with are working together to expand and improve services, and to lead change," said Fran Burnham, the mother of an adult with developmental disabilities. "This feels like the best-case scenario to keep consistency in my daughter's daily life, which she needs, but also help improve the care we receive." The new partnership will ensure that experienced Care Coordination organizations are driving the formation of the state's required provider-led Specialized I/DD Plans (SIPS).